Another Passover favorite. I believe this recipe is from my mom’s old Hadassah cookbook. Combine eggs whites, vanilla, and salt. Beat until stiff but not dry. Beat in sugar until mixture is stiff and satiny. Bake at 300 degrees for 25-30 minutes. Makes three to four dozen. I use mini chocolate chips. Instead of greasing a cookie sheet, I use parchment paper. After taking them out of the oven, I slide the parchment off the cookie sheet and let the meringues cool completely. I made these in a cooking class once and they were super sweet. However, very delish! just wanted to let you know that i made the flour-less chocolate cake today and it was really yummy! i’m living abroad for the year so i didn’t have a springform pan, but it worked pretty well in aluminum pans. i served it with fresh whipped cream and strawberries and it was fabulous! thanks for the recipe! i love both your blogs! Im a guy…i wanna start baking…seriously now, is it hard? I probably want to start with cookies or something…. I once attempted baking oatmeal square biscuits…they came out a huge flop. I think i may have put too much butter in…. Take it from someone who knows — start with brownies. And until you gain some experience, follow the recipes. I have made these meringue cookies for years…but as Forgotten Cookies. What you do is preheat the oven to 350 and line 2 cookie sheets with foil, then spray with Pam. Prepare the cookies as directed above (and I add 1 c. broken pecans or walnuts along with the mini chips). Once you place the filled cookie sheets in the oven, turn it off and leave it alone overnight with the door closed. 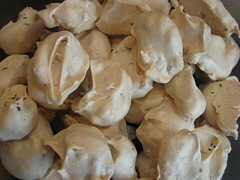 In the morning you will have perfectly prepared “Forgotten” meringue cookies. Or if you are in a bind and need the cookies same day and perhaps you need to leave the house and don’t like leaving the oven on, you can reduce the oven temp to 250 when you put the cookies in, bake for 40 minutes, then turn the oven off and leave them alone for at least 40 minutes to complete baking. I’ve made these both ways and never had an issue.